Gumbo is a dish from Louisiana that has a really cool cooking technique and an ingredient that I’d never used before. 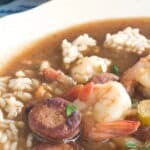 Find out all about it here and get my easy shrimp gumbo recipe. This is a sponsored conversation written by me on behalf of Aidells®. The opinions and text are all mine. I was thinking about how I want to have quick-cooking ingredients and quick dishes for busy weeknights. I thought it would be fun to combine both some shellfish and sausage because fully cooked sausage like andouille and shrimp are such quick-cooking ingredients. It also occurred to me that I had never in my life made gumbo, which I was pretty sure sometimes had both shrimp and sausage. I did some research to find out what was involved. I was right. And it’s actually a really unique cooking method and it contains an ingredient I’d never encountered before. What a fun way to bring sausages to our dinner table! The cool cooking technique is a roux (a flour and oil mixture used to thicken soups and sauces) that you cook in a pot until it’s as dark as peanut butter. If you’ve never made a roux before, here’s more about it. This gives gumbo its distinctive gravy color and also a really nice nutty flavor. While that’s cooking, you slice and then cook up the sausages in a skillet. You also chop up what’s known as the Cajun holy trinity of vegetables, celery, onion and green bell pepper, plus lots of garlic. When the roux is dark, you add the vegetables and cook them until soft. Then you go in with some broth and water and seasonings. Cayenne and thyme are the usual suspects. And salt and pepper, of course. When the liquid is simmering, you add the darkened sausages and the shrimp. Cook until the shrimp are pink. We’ve been eating a lot of shrimp lately because they’re keto. While this dish isn’t, I love to have keto protein on hand and shrimp are one of them. Then, here’s where the really cool thing comes in. You add an herb called filé. It’s the powdered leaves of the sassafras tree. It lends a distinctive flavor and thickens the liquid a little bit. I found the filé powder in the same Publix where I got the sausages. It was in the aisle with the herbs and spices. It was low down below the spices. I actually had trouble finding it but a nice staff member helped me out. (I adore the staff at my Publix. They are beyond friendly and helpful). A quick note about thickness. Some gumbos are really thick, like a gravy. I did some reading and it turns out it’s supposed to be more like a thick soup, like the thickness of cream of mushroom soup. That’s what you’ll get here. If you want it thicker, you could make more roux at the beginning and add more file powder at the end. But taste as you add because it does have a strong flavor. I hope you loved hearing about this unique dish. And now here’s my easy gumbo recipe. If you make it, let me know in the comments below. Have a great day! Gumbo is a dish from Louisiana that has a really cool cooking technique and an ingredient that I’d never used before. 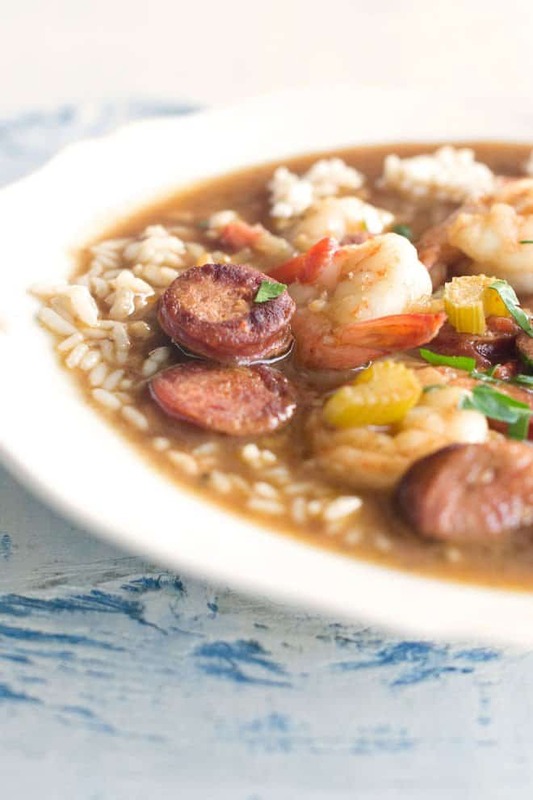 Find out all about it here and get my easy shrimp gumbo recipe. Into a Dutch oven or large pot measure the flour and vegetable oil. Whisk them together to combine. Cook over medium heat while whisking occasionally until as brown as peanut butter, about 6-8 minutes. If it starts to bubble a lot or brown in spots really quickly, turn heat down to medium-low or low. Meanwhile, put the sausage in a dry medium skillet over medium-high heat, stirring occasionally until blackened in spots, about 5 minutes. When the oil and flour mixture has reached the right deep brown color, add the celery, onion, bell pepper and garlic. Cook on medium-low heat until softened, stirring occasionally, about 7-8 minutes. Meanwhile, combine the beef broth and water in a large microwave-safe bowl and microwave on high power for 5 minutes. Stir the broth into the vegetables a little bit at a time (about 1/2 cup) stirring constantly until it is all added. Add the tomatoes, salt, black pepper, thyme, and cayenne. Stir. Heat over medium-high to a simmer. Add the shrimp and the sausages. Cook until shrimp are pink and opaque, stirring often, about 4 minutes. Stir constantly while sprinkling in the filé powder. Cover and let sit 10 minutes. Serve over rice. This post originally appeared in March 2016 and was revised and republished in October 2018.